You can’t have a marching band without a percussion section and that beat that keeps everyone marching together is coming from that large marching bass drum. That low-end boom is essential to not only keeping all of the rest of the instrument on time, but it keeps the entire band marching at the right pace. 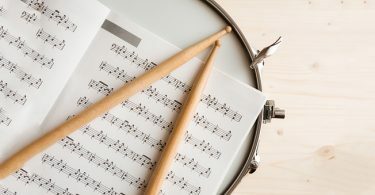 If you are a band director looking to add or replace a marching bass drum, here are a few pointers on what to look for and a few reviews to help you start your search. As a drummer for over thirty years, I have learned the importance of good quality and tone in a drum. With marching drums, you also need to consider how lightweight it is and how comfortable you are lugging it around. It’s always important to check out an instrument in person to make sure you like the sound and quality, but in this case, you also want to test how easy it will be to carry around on a football field or a couple of miles in a parade. Durable, very lightweight and not too expensive. Precise and high-tension tuning for an awesome sound, has a shallow depth that makes it easier to carry. One might think there is just one type of marching bass drum, but that couldn’t be farther from the truth. Depending on the brand and model you choose, you have your choice of size and sound. Each brand of marching bass drum is intended to be used in different ways and their size can also dictate their use depending on their sound. When a bass drum is struck, the shell of the drum resonates at low frequencies that give you that big booming sound that we all expect. Plus, it lets the drum sound loud enough to be heard against all the other instruments in the marching band. The most common wood that is used to make drum is maple as it gives drums a balanced and warm sound. A harder and brighter sound is made with a birch drum shell. This bright and loud tone helps the drum clearly cut through any of the other instruments around it. Birch wood also features lows and highs with a reduced midrange. Slightly warmer than a maple shell, mahogany gives you an increased low end and less highs in the midrange. Mahogany is often characterized as sounding more “vintage” than other shells. A low-cost alternative to birch and maple that has a similar sound is a poplar wood shell. Oak also has a similar sound to maple with a bright and powerful sound, but more porous composition. Drum shells are created with several layers, or plies, of wood. A general rule of thumb is the more plies a drum has, the brighter the sound. The fewer plies, the warmer and fatter it will sound. It is imperative that marching bass drums have a lightweight design otherwise it would be torture to carry the instrument around a football field. If a drum is painfully heavy, no one is going to be able to get it down the length of a parade. 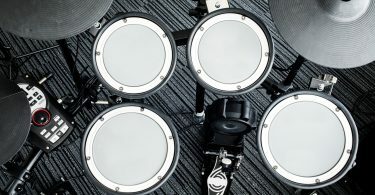 So, when you are searching for a new marching bass drum, one of the most important features to look for is how light it is compared to its competitors, and it is important to actually test it out to make sure. Another key factor that also depends on the marching bass drum’s weight is its portability. It is imperative that you purchase a marching bass drum and not a conventional bass drum which is far heavier. A marching bass drum is designed to be portable and lightweight so you can play it easily while you are walking. It is very hard to carry and a conventional bass drum and play it at the same time since it is not designed for that purpose. 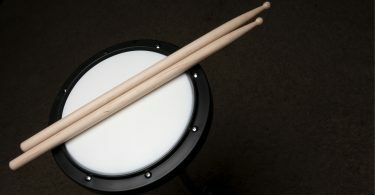 One standard features that most marching bass drums come with is a mallet holder, although you can purchase one separately if your drum does not come with it. Mallets are designed with a unique low tone and some will create a delicate low-end accompaniment and others make a somewhat explosive sound that works extremely well on marches. The holder lets you switch out mallets as you play, so you can have control over your tone and sound while you play. The universal marching bass drum size is the 14 inch depth and a diameter that is measured in increments of 2 inches. The heads are typically a sleek white PET film that gives them a tone that is somewhere between that of a clear and a coated head. Marching bass drums are mounted so that the head faces out from the harness, unlike the tenors and snares, and this allows the player to play on both sides of the drum. 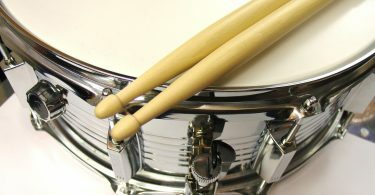 Drum lines are very common in marching bands where each drummer carries and plays one drum creating a line that encompasses different sized drums. These types of drums are called tonal bass drums. 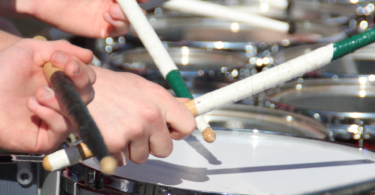 Instead of a tone, the lowest drum in a drum line is tuned to make that low thump of a traditional bass drum. rather than a tone. The first marching unit to use this type of tuning was the Cavaliers Drum and Bugle Corps who made it a standard. Many drum lines use the largest bass drum that their largest bass drummer can carry comfortably for a long period of time. Corps-style bands assign one bass drummer a segment of the total bass drum part, unlike the snares and tenors which is called a split part. When all or most of the bass drummers play at the same time this is called playing in unison. Depending on the size of the marching band, a corps-style line can have a little as three players and as many as nine. Most commonly, you will see a corps-style line with five players with drums ranging in size from 18 to 32 inches. There are also some traditional groups, like show-style marching bands that still use a non-tonal bass line that has all the drummers using the same size drum and playing the same part. After hours of testing and research, here's the final competition. Sharing several of the high-end materials and specifications of the Field-Corp Series, the Yamaha Power-Lite also features durability and sound but is made for non-competitive marching bands that want their equipment to weigh less and come in at an affordable price point. With a perfectly round shell, the Yamaha Air Seal System guarantees its product shape for a lifetime. The Yamaha Power-Lite has a 45-degree bearing edge with accurate tuning provided by the Air Seal System. Zinc, die-cast construction reinforces lug casing for high-tension tuning while steel and nylon washers lessen friction. The birch shell features a lightweight 9-ply design with solid rib design featuring steel claw hooks to guarantee it retains its shape and gets rid of excess stress. Specially designed Sound Impact Strips also get rid of unnecessary overtones and give you a clear tone. When you need a lightweight design but incredible sound, the Yamaha Power-Lite Marching Bass Drum is the perfect choice with a shallow depth that makes it an easy drum to carry. There are sizes that cover the entire tonal spectrum ranging from 16 to 28 inches and the MQ-6300 Power-Lite Series has a lightweight design that is popular with community bands and young percussionists. The Yamaha Power-Life MB-6328 has a white wrap finish and features a Power-Lite lift-front carrier that comes with a break-away rail. The 9-ply birch shell is made with the specially designed Air-Seal system that makes the drum durable and gives it a good punch with a warm tone. The Air-Seal System™ is used with all Yamaha bass drum and guarantees that shells stay round while providing a pure fundamental and clearer tone while the 45° bearing edge lets each drum creates its own precise articulation. The base drum hoops are also part of the Air Seal System giving your precise tuning that can be easily maintained by the 10-ply mahogany and birch hoops. Yamaha 6300 Series Bass Drums come equipped with REMO Ambassador heads and lug casings made of zinc alloy with webbing and reinforced walls that give you the strength you need for high-tension tuning. Tension is distributed over a large area of the hoop with the steel construction of the claw hook rib design that makes sure the shape is retained getting rid of excess stress. Tension rod washers are made of steel and nylon allowing for smooth high tension tuning. The Yamaha Power-Lite is available for around $420. If you’re looking for a durable marching bass drum, the Dynasty series is worth a look. The Dynasty is created with an 8-ply maple shell, chrome-plated hardware, and specially designed claws that allow you higher pitched tuning and increases durability. The Dynasty Marching Bass Drums have a rich tone that works well with any percussion ensemble with standard hardware chrome plated hardware and there are several finishes available. Dynasty has been a major player in the music industry since 1999, Dynasty crafts their marching bass drum with aluminum endurite casings and hearty maple shells. They feature their reverse threaded fitting engineering and rugged claw hooks that allow you to adjust your drum heads to a higher tension without worrying about the claw failing or underperforming. Dynasty typically manufacturer their drums in white or black, but they can be customized with enough lead time. 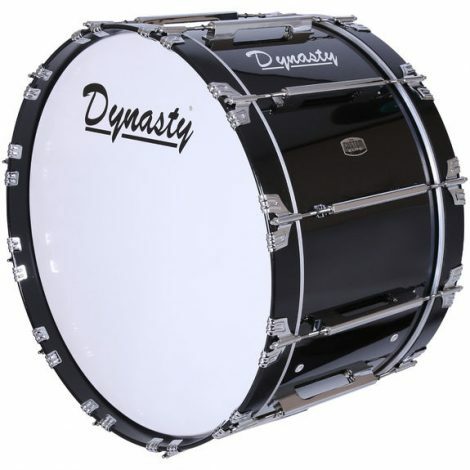 The Dynasty Marching bass drum is available for around $650. For a fun customizable experience, the Mapex Quantum Bass Drums features maple shells that come in standard and special order lacquer finishes. Chambered aluminum rims get rid of the need to purchase rim protectors, and the Quantum marching bass drum gives you a balanced and consistent feel and sound with the progressive air vent placement. The lightweight tube lugs give you full resonance by reducing shell contact that has a visual style that is specially made for the Quantum line, plus it includes Remo heads. Standard finishes include red metallic, gloss white, gloss black, gray steel, blue steel, and silver diamond dazzle. For an additional cost, you can choose one of the special order lacquer finishes that include transparent cherry red, caramel fade, blue galaxy sparkle burst, black forest fade, transparent midnight black, supernova red sparkle burst, black sparkle, and galaxy sparkle burst. You can also custom order hardware finishes for an additional cost in gloss chrome, black, white, gold, and graphite while satin chrome hardware is found on all Mapex marching bass drums with no extra cost. 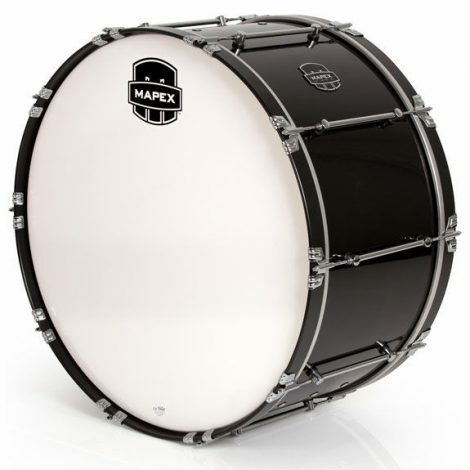 The Mapex Quantum marching bass drum is available for around $450. 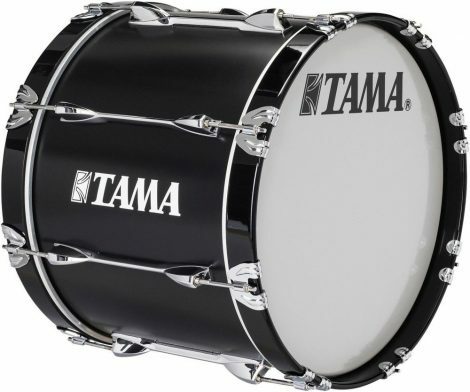 The Tama Starlight Marching Bass Drum comes with a 100%, 7-ply birch shell with low-mass cast aluminum hardware. 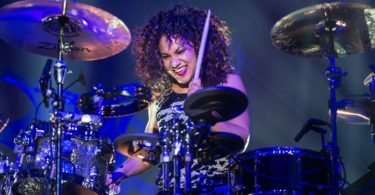 Tama has a well-known in the music industry, but has been less involved in the bass drum market. The Tama Marching Bass Drum shell is created with a mix of birch and Bubinga to make a powerful drum that is also lightweight. 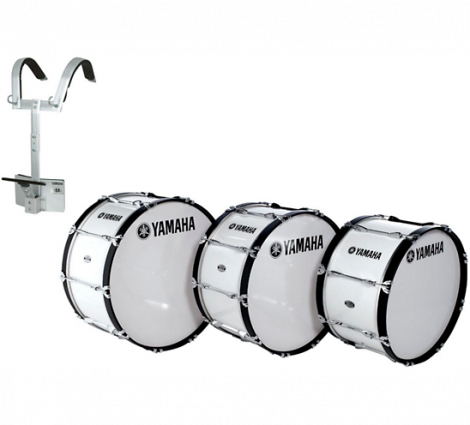 The Tama Marching Bass Drum has a height-adjustable chest plate, plus a safety lock mounting system with a two-way support bar and padded shoulder pieces that are adjustable. Tama is known for its innovative design work and features the “Tama Noiseless Carrier” which is a joint locking system that gets rid of space in between the drum carrier and the bass drum. This design lets the bass drum sit up against your body making is stable and playable. The Tama Marching Starlight Bass Drum also includes claw hooks that are a great addition even when you need a lot of tension placed on the drum head. The Tama Starlight Marching Bass is available in the low $300s. Another great Yamaha product is the Yamaha 8300 Series with its sleek, easy to operate shell and awesome projection and tone. Tuning is easy and consistent with this 9 ply maple hoops that give you accurate articulation. This Field-Corps drum was created for those top tier marching programs giving you a punchy attack with a deep and resonant tone. These are incredibly versatile drums perfect for either indoor or outdoor use and produce thunderous booms with the larger models and precise focused tones with the smallest. 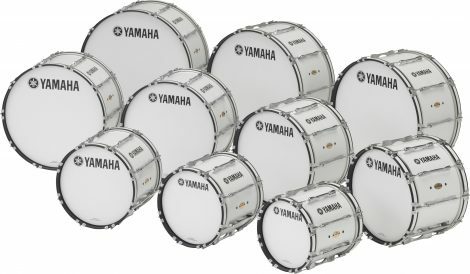 The Yamaha 8300 drums have maple shells with a 14″ depth and air holes that are located for individual optimization for each of the drum sizes. The somewhat thin shells are portable and easy to manage while still giving you punch and power. Their 7-ply maple shell gives you accurate balance with resonant and deep tones. This is a lightweight drum that makes carrying it comfortable and the Air-Seal System guarantees that the shells stay round which gives it a clean and pure tone. Specially made tension bolts give you added strength to handle tuning at a high tension and 5.4mm steel tension rods make sure that tuning is easy without making the drum heavier. 45-degree bearing edges give each drum exact articulation while the lightweight, die-cast aluminum lugs have Yamaha’s unique arch-shaped center. Yamaha’s original straight-line design lessens contact between the lug and shell so the shell can freely vibrate giving you a greater tone production. Compared to previous models, lug designs are 60% stronger and 26% lighter than previous models. The Yamaha 8300 Series is available in the mid $400 range. If you are looking for a good low-end punch, the Pearl Championship Series gives you a 100% maple shell with 6 plies that give you a robust sound in a durable drum. The Pearl Championships Series gives you the most resonance and huge sub-frequency projection. Two-inch maple hoops enhance the maple shells and include extra wide claw that gives you an even dispersion along the hoop’s circumference. The high-strength aluminum casings are lightweight and the tension bolts are case hardened giving you strength in a lightweight package that won’t tire you out. You can get the Pearl Championship Bases in several different color and finishes, plus they can be customized to match an outdoor ensemble. The Pearl Championship Series Marching Drum is available in the mid $300s. 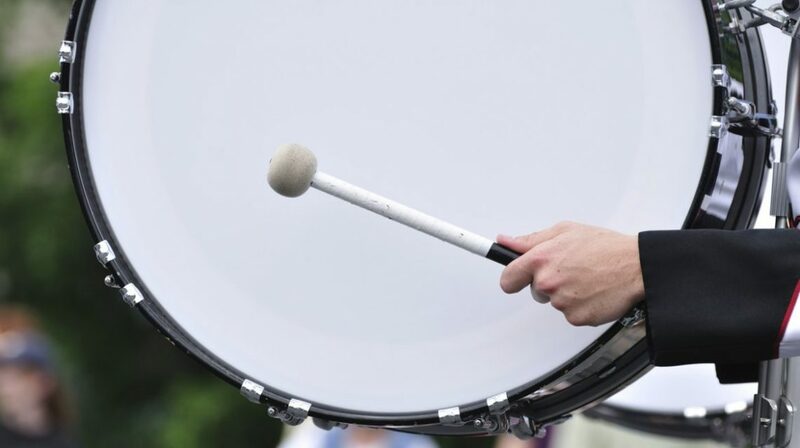 With a 7-Ply birch shell and die-cast lugs, the Sound Percussion Labs Birch Marching Bass Drum is incredibly versatile and can be used in parades, school performances, and halftime shows. It includes Remo Powermax heads and a free t-style carrier. The specially designed 7-ply birch shells have select air hole placement that gives you optimal projection that creates tone and proper articulation. The die cast lugs feature resonance isolation that gives you a lot of strength, and the metal doesn’t touch the shell. Also, includes a set of mallets and a free t-style lightweight carrier that is worth between $150 and $200. You get all this for only $265. The Trixon Field Series Marching Bass Drum uses 100% birch shells because it is the densest of the woods giving the drum more reflection in its vibration and frequency instead of it all being absorbed. You get a chipper edge with birch wood’s unique properties and density which is great for pep events, marching, and drum and bugle, and pep events. 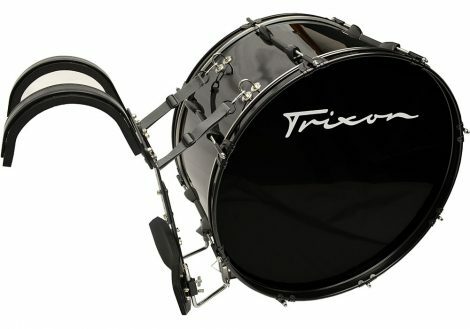 The Trixon Field Series features 7 ply shell with 9 column lugs and birch hoops. The lightweight aluminum contouring and adjustable carriers are also included along with Remo drum head and acoustic air vents. The Trixon Field Series is available for around $300. For our younger players, we have the Pearl Junior Marching Bass that is perfect for both elementary and middle school-age players. Pearl is a well-known name in the school instrument market in Japan and has now entered the U.S. market with a high-quality instrument this is a good size and at an affordable price for younger players. 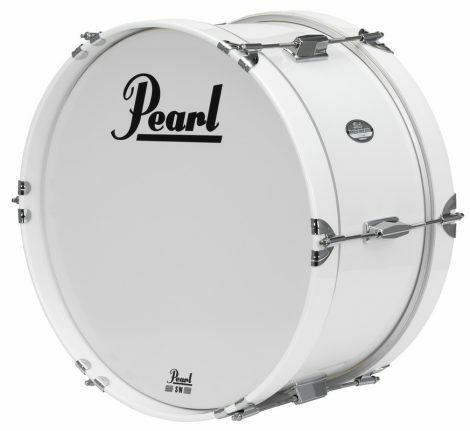 The Pearl’s Junior Marching Bass Drum has a poplar shell that is durable and comes in several age-appropriate sizes for even the youngest players. It comes field ready and is covered in a classic #33 Pure White wrap that includes the matching white powder-coated MCH20B carrier that is pre-assembled. 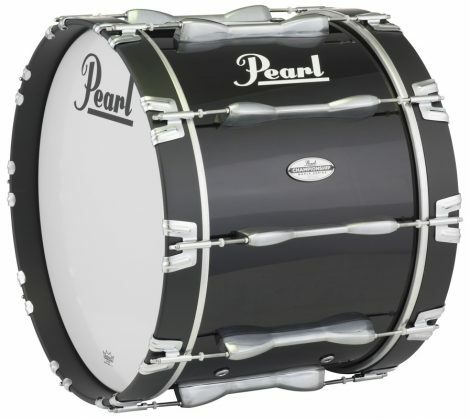 The Pearl Junior Marching Bass Drum is available for around $300. Next is a drum that is not only lightweight, but has a versatile tone and boutique features. 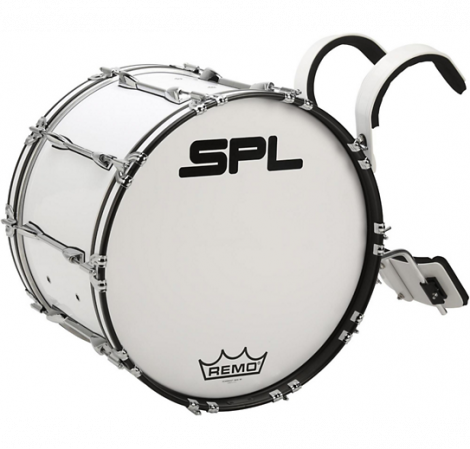 The Premier Revolution Bass Drum has a unique sound that is lightweight with a modern look. Premier’s weight-saving features do not compromise its build quality, and it is used by percussion ensembles, drum corps, and marching bands around the world. The Premier Revolution Bass Drum comes with a 4mm, 2-ply birch shell plus high-tension low-mass lugs designed that are “blasted chrome” with a 4.8mm reinforcing ring. Premier also features its Tension Diffusion Technology (TDT), 10 mm mahogany hoops, and is covered with a gloss lacquered shell. This drum is available for around $400. 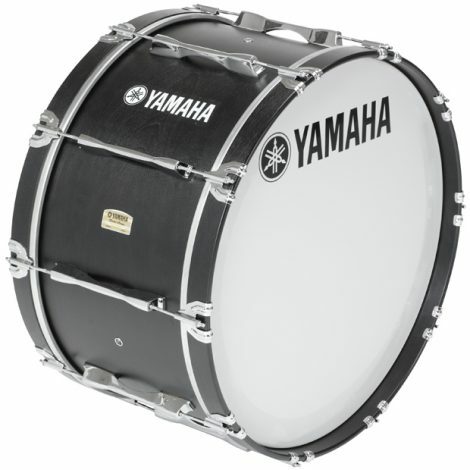 Yamaha’s field-corps marching bass drum was created for the top marching programs giving players a forceful attack with a deep, resonant tone. Depending on the size, the smallest sizes will give you a focused tone while the largest will give you a thunderous boom. These are versatile drums for both indoor marching and marching outside in parades and on the football field. The Yamaha MB-8200 have a 7-play shell that is a mix of mahogany and birch to give you an accurate balance of resonant tones that are deep with a solid and punchy attack. This is also a lightweight shell compared to its all-hardwood competitors. Similar to the Yamaha marching multi-toms, the MB-8200 Series use their special Yamaha Air-Seal System that guarantees that the shells remain round to give you a pure and clear fundamental tone. The 45° bearing edge gives the bass drum a clear and pristine sound. The shell is allowed to vibrate freely producing a greater tone with the lightweight, die-cast aluminum lugs that are created with a special Yamaha straight-line designed arch that lessens surface to surface contact between the lug and shell. The lugs are 60% stronger and 26% lighter than previous models. The 10-ply hoops are strong enough to give you tuning that is uniform and consistent. 8200 Series Bass Drums come equipped with REMO heads and great tuning stability is provided by the claw hook design that reduces stress on the tuning bolt in those high-tension situations. This guarantees that tuning adjustments are easy and there is less hoop damage. Sound Impact Strips get rid of unnecessary overtones and give you a clear tone with easy tuning while the 5.4mm steel tension rods provide consistent tuning without adding unnecessary weight. The Yamaha MB-8200 come in ten different sizes including 14″ to 32″ and covers a range of the tonal spectrum. The Yamaha MB-8200 is available in the mid-$500s. Guitars Strumming or Plucking the Strings: Which is Best? 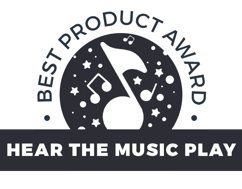 If you notice a guide that needs a little more care, or has errors, please email us at hello@hearthemusicplay.com or fill out the contact form and we’ll fix it! Thank you. When you click on a link that we recommend and make a purchase, Hear the Music Play may get a small share of the sale at no additional cost to you.